We discovered the following article (Part 1) on Houzz and thing it’s worth sharing with our audience. We’ll share the rest of the article later. The are many issues to consider when contemplating your television viewing experience, including the TV size and quality, and the distance from the television to the primary viewing location. But for one characteristic, there is a simple and concrete rule: The ideal center of the screen should be at the eye level of the viewer. So the factors that come into play when you‘re considering only the ideal TV height include the height of the typical viewer and the size of the television. 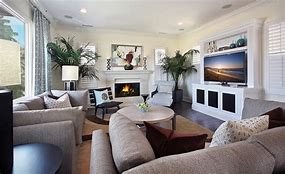 You can measure your television and do the math, but the optimum center of a television intended primarily for viewers seated on a couch is typically about 42 inches above the floor. Let’s say you select a 60-inch television. A 60-inch television is about 32 inches high, meaning the center of the screen will be at 16 inches from the bottom of the television. Most sofa seating heights are close to 18 inches above the floor, and eye level for an adult seated in a relaxed manner is about 24 inches above the seat. That puts the optimum, center-of-television height for a typical seated viewer at 42 inches (18 inches + 24 inches). So that 60-inch television should be installed with the bottom of the screen at 26 inches above the floor.